I watched the early minutes of TrailheaDX 2017 this morning not entirely convinced – the event kicked off with a celebration of Salesforce culture, noting the company’s efforts in diversity and inclusion. Showing is generally far more convincing than telling though when it comes to diversity and inclusion. Then Leah McGowen-Hare came on to present and everything changed – she totally owned the whole keynote. Initially presenting Artificial Intelligence and Machine Learning APIs, then moving on to Continuous Integration/Continuous Deployment (CI/CD). Leah’s talk was snappy, crisp and totally on point. It was funny, totally confident and very informative. I will be posting more about it tomorrow, but for now let me help bridge the gap. If Salesforce wants to hit 10m admin/developers, let alone the crazy stretch goal of 100m it cited today, then it will need to bring entirely new communities into the field. People joining Salesforce from diverse backgrounds now have another leader to inspire them. This post explains more about what I am talking about. I talked to Leah after her talk. We discussed inclusion and the importance of powerful role models. You can’t be what you can’t see. 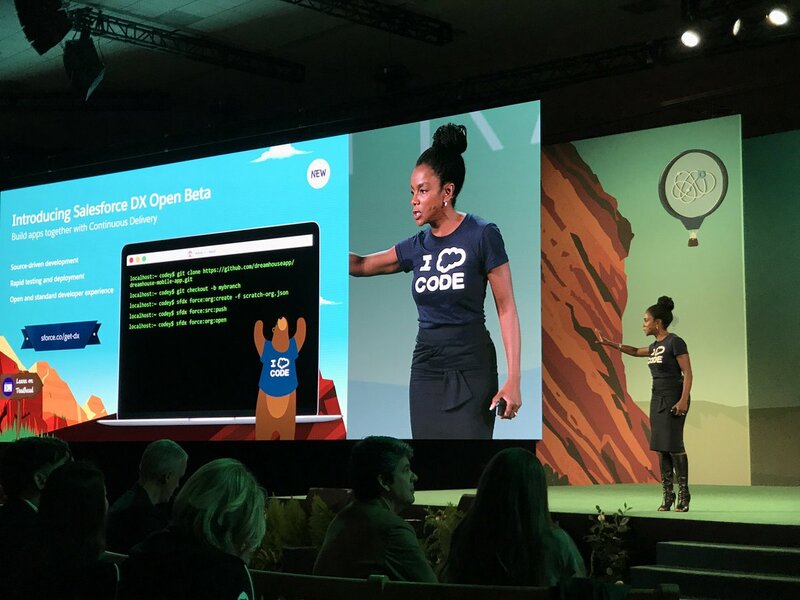 Having Leah crushing it on stage will stand Salesforce in good stead in both attracting more admins to the platform from a range of backgrounds, and having these people think that they can be developers too, whether configuration, visual or code led. Salesforce is a client and paid T&E.